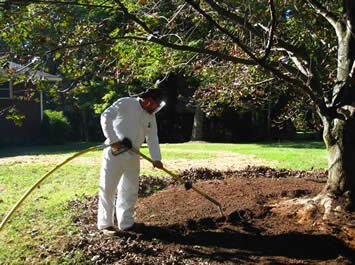 Fertilization is important in the maintenance of shade and ornamental trees in the landscape. Unlike forest trees, trees in human-altered landscapes are often growing in poor, compacted soils. Competition with grass and turf is an unnatural environment for trees. Tree fertilizers are designed to improve the soil by adding essential elements. We use a high grade, slow release formulation which is injected directly into the tree root zones. The fertilizer contains 40% slow release nitrogen with an extremely low salt index. Fall and/or spring applications provide excellent residual release, will not leach and will remain in the soil for continuous uptake throughout the year. 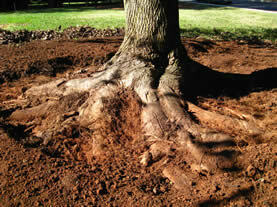 Radial trenching is an effective treatment for trees growing in compacted or poor soils. It is a way to get oxygen to roots, replace soil, and to alleviate compaction. Trees in construction sites and other high traffic areas benefit from this method of soil re-conditioning. Radial trenching enhances both water absorption and oxygen levels in the soil. New Technology – We use an air spade to remove soil radially from the trunk out to the roots. The heart of the AIR-SPADE is the patented supersonic nozzle which produces a focused “laser-like” jet of air at approximately 1,200 mph. This air jet penetrates voids in the soil and expands rapidly, fracturing and cultivating the soil. The air jet is harmless to non-porous objects such as tree roots, buried pipes or cables. The AIR-SPADE is ideal when trenching for underground sprinkler systems. Narrow trenches are created using high air pressure in a radial pattern throughout the root zone. These trenches appear similar to the spokes of a wagon wheel. Trenches will be 6-12 inches deep and 6-8 inches wide. Using high pressure air tools causes minimal root damage.The narrow trenches can be backfilled with the topsoil or compost. Root growth will be greater in the trenched area than in the surrounding soil. This can give the tree the added boost it needs to adapt to the compacted soil or new grade. Radial trenching also allows for inspection of the root crown -a transition zone critical to tree health, as well as, supporting and anchoring the tree in the soil. The AIR-SPADE can be used to uncover the tree’s root crown a transition zone area where the trunk and root system come together. Uncovering this area is important when diagnosing trees for rotted roots, girdling roots and/or decayed trunks just below grade. 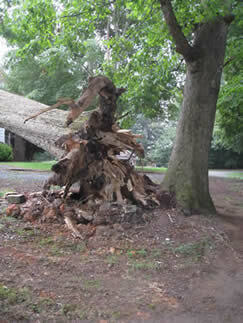 Often deterioration at the root crown interface results in hazardous trees that are likely to be blown over. This is an important step in determining if a tree should or should not be removed. 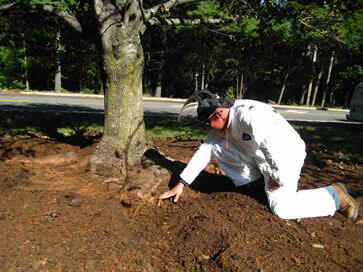 During a hazard tree evaluation, our arborists can determine if a root crown excavation is necessary. The photo below shows a healthy root crown. The failure of this white oak pictured below could have been easily predicted with a root crown excavation. Using the AIR SPADE to look below grade would have given sufficient evidence that the root system was severely decayed. This tree was extremely hazardous and should have been removed before falling across a driveway and on top of a house. Sometimes it becomes necessary to remove an enlarging root that is beginning to buckle a driveway or a sidewalk. Construction sites often require knowing where roots may be growing underground prior to building as a way of knowing the potential impact to the tree or to the subsequent construction. Air spading offers a quick and efficient way to find root growth when trenching for irrigation lines. This process allows trenching for underground lines with no damage to tree root systems or underground utilities. Below, Mike Stoltz uses the AIR SPADE to cut a narrow trench in order to find any weeping willow roots that are growing toward a nearby septic tank. Clean cuts were then made with a pruning saw of only a few offending roots, thereby assuring minimal damage to the tree while protecting the septic tank from tree root invasion.